When it comes to creating the perfect working environment, there are endless aspects to keep in mind. 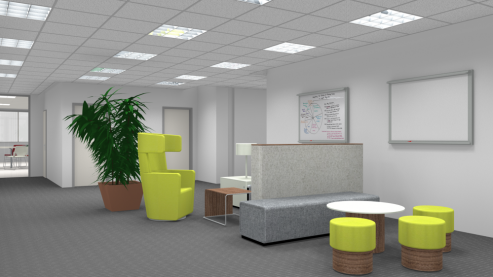 What do you want the space to do for employees, how do you want them to feel? 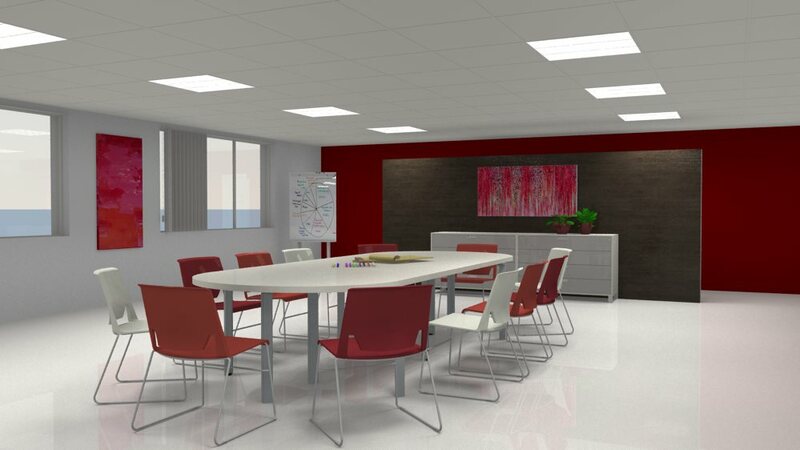 Are you creating a room intended for group work and brainstorming, or looking to create a space for relaxation? In today’s blog, we’re taking a look at some of the top design aspects to keep in mind when designing the ideal office space, and how pCon.planner can help you accomplish these design goals. From the construction of a room, down to the colors of its accessories, every detail counts. You’d be surprised just how much your mood can control your productivity and creativity in the workplace. Uncontested by the majority of designers and ergonomics experts is the positive impact of natural lighting. Let’s face it, if we’re forced to spend most of our day indoors, a little touch of nature most certainly won’t hurt. Not only does natural light increase our attentiveness leading to better productivity, but study after study has shown that it even improves our lives outside of the workplace. When designing a workplace, think about the amount and size of the windows you’re putting in. More windows equals more natural light, or in other words, happier workers! 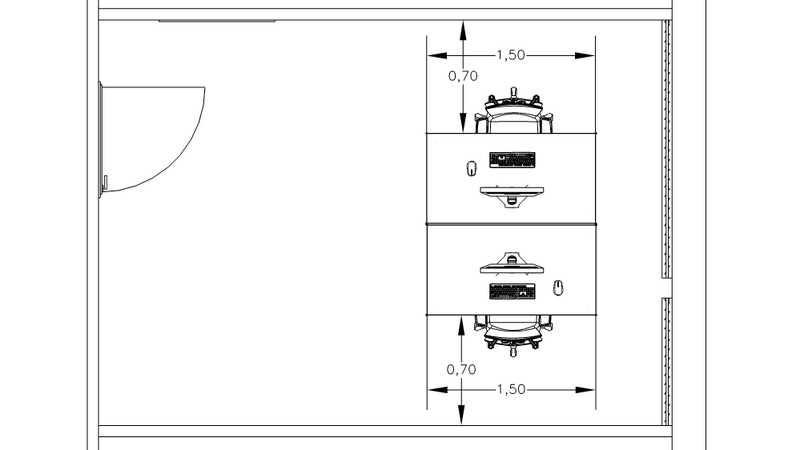 Within the wall elements section of pCon.planner, you have numerous options for window shapes, sizes and types. You even have the option for various models of blinds. 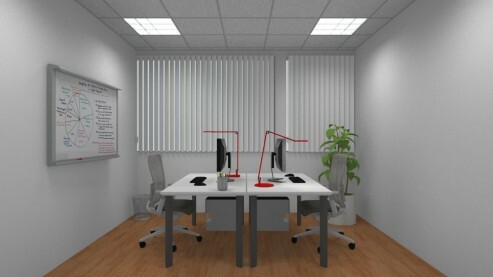 With this option, you can fill the room with natural light, while still providing the option for a versatile workspace. Perhaps you’ve been given an existing plan and don’t have the option of adding windows. Try a combination of both direct and indirect lighting fixtures. Versatile lighting means a more versatile work space. While direct lighting may be too harsh to be your one and only lighting choice, a healthy dose of direct lighting can better illuminate a work space, reducing headaches caused by working in a dim environment. 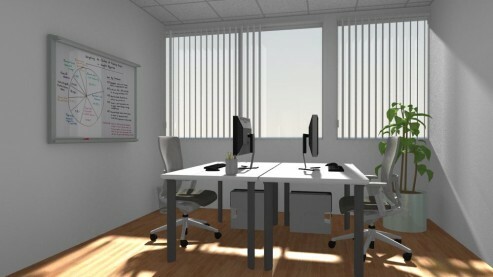 To avoid glare on computers, however, a more indirect lighting is appropriate. Working with both direct and indirect lighting can help you create a more natural mix of shadows and illumination. Try placing lights parallel to a worker’s line of site to reduce glare, or parallel to the windows to create a more naturally lit atmosphere. The room elements section in pCon.planner provides you with any lighting option your heart desires. Insert a ceiling grid into your plan to attach indirect lighting fixtures, or find a desk lamp within the pCon.catalog for a direct lighting option. Sometimes our most creative concepts come when we’re not thinking at all. When employees are comfortable and able to openly communicate, the best ideas come pouring out. For the break room, try going for an open layout with comfortable furniture. In addition to the much needed table and chairs for lunch, a communal area with a few comfy couches and end tables should do the trick. Not only will a relaxed common area give your workers a much needed break from the office, but it can foster community and help employees bond. With that said, however, it never hurts to have a few white boards here and there to jot down ideas when the creative juices start flowing! Take a look at our pCon.Catalog “Home” section to pick out the ideal furniture for a comfortable and creative break room. Color isn’t simply a choice of favorites, it can actually have a positive, or sometimes negative, psychological effect on employees. Reds: Red stimulates the brain. Perfect for areas where a lot of brainstorming activities takes place. Oranges and Yellows: These keep employees awake and alert. They’re better shades to incorporate into individual offices. Greens and Blues: These are psychologically calming, yet motivating colors; great for the break room. Let’s not forget the neutrals, however. A neutral base with splashes of color tends to be the perfect combination to invoke a creative, stimulating environment without overwhelming workers. Try a highlighting wall or accessories like rugs and colorful paintings to even out a more neutral space. Within the Edit Tab of pCon.planner you’ll find the Material Editor. Here, you can change up everything from wall and floor colors, down to the types of materials you use for room accessories. Colorful accessories can also be found within pCon.catalog. The creativity possibilities are endless! Last, but certainly not least, give workers a place that makes them comfortable. Employees need a little space to breathe. Leave at least 70 cm between a desks and any wall for room to move in or out with the desk chair. Working with a small place? Replace an extra set of drawers with shelves no more than 48 cm above the desk. Make an office space even more desirable by placing the desk in front of or near a window with a view of trees or nature. Nothing is less motivating than staring at a blank wall for 8 hours a day, right? And with desk placement in mind, avoid putting a worker’s back towards the door. Not only is this uninviting for co-workers and visitors, but it also puts the worker in a more vulnerable position. In the lower right corner of your pCon.planner viewing screen, you can edit and see the distances between room elements. Use this tool to help provide the necessary amount of space between objects and walls. There you have it, our top 5 design tips for a more productive office space. We know we certainly haven’t covered all the dos and don’ts of the perfect workplace, but we hope it’s given you a little inspiration and direction for your next design adventure. So, what are you waiting for? Open up pCon.planner and let your creativity run wild! Be sure to subscribe to our RSS Feed to stay up-to-date on the latest tips, tricks and pCon.planner news. This entry was posted in Do you know?, General, Room Planning. Bookmark the permalink. I have worked in many different types of offices and I think that the best ones were those that felt the most comfortable. They had great break rooms, fun furniture, and really cool graphics on the wall. If you were to add a sixth tip, you should deffinitely add wall design. Do you have any tips for those designing an office to go about that? Thanks for your design tips. I think that my favorite is making sure the office is comfortable. I have worked in my fair share of cramped offices, and I always hated it. So, space is good, but if it isn’t possible I think having a window or more colorful walls could make up for some of the lack of space. My dad is moving into a new office and thought it would be a good idea to update his office furniture. I like your suggestion of finding some comfortable furniture for the break room. I have always enjoyed working for companies that provided this for employees. I thought it made a big difference. Thanks for the suggestions. You made some great points about how to create a work space that’s comfortable for employees. I liked your point about how crucial it is to provide a space where employees can feel comfortable and have a place to rest where their ideas can flow more freely. All of those concepts seem like an important part of the design process of an office environment. That reminds me of something I read about how effective work spaces start with a great design rather than with having great furniture or nice colors. According to the information that I found on http://midwestcommercialinteriors.com/whatwedo/, a good office design streamlines the work process and facilitates teamwork, productivity, and efficiency. If there’s anything that a work place should achieve in its design, it’s to have a design that will improve the way employees work together. That’s really interesting that colors can influence the psychological state when it comes to office design. If often found that functionality and comfort of office furniture can help me perform to the best of my abilities. I’ll have to think about putting some red in my work space since I do a lot of creative work. In the real estate world, many clients looking into designing a home office. I love this blog!! It really can help me provide value to them when they are picturing themselves in a home and their office! I like the idea of having a creative place to go take a break. My office has been trying to think of ways to make our office more comfortable and unique. I think I might suggest trying out some cool furniture in the break room. Office furniture doesn’t have to be boring especially if it is only used by the employees. I can’t wait to suggest this at the next meeting. We are happy we could give you some inspiration. Let us know how your suggestions was received. I agree that natural light to so important in the design for an office. For me, having enough light to work is vital to productivity. Also, it is interesting what different colors can do for productivity or setting emotions. These are all great ideas. Thank you so much! Can you make explain more on such tips because these tips are not fully applicable for my Office room. I have furniture which i caught through http://www.melbourniansfurniture.com.au/bedroom-furniture/ really good job they did but main problem is how to decor my favorite furniture. Any more tips would you like o share with us. I will start a new business with in a few days. I want to create my office work space comfy and enjoyable for employees. In this situation, your tips are really very effective to me.I think, it’s very important when designing my workplace, think about the amount and size of the windows with perfect shade. I prefer green color among your three suggested color for my new office. Because Green color is psychologically calming, yet motivating colors. Finally, It’s a great informative article and really helpful to me. Thanks for sharing this valuable article. Thanks for your kind words, we’re happy the post helped out! If you ever have any suggestions for other post topics that would also help you out, let us know! Also make sure that you have storage that works for your team, and everyone has adequate desk room and enough room to move their chairs. I thought it was interesting that color can have a psychological effect on employees. When you are redecorating your office space, keep in mind that your employees are gonna have to sit and see that color every day. Pick a color that is stimulating but can still allow them to focus on their work. When I first got a desk job, my first irritant was the color of the wall next to me. It was plain white, a boring color next to it left me bored with the surrounding area. Thanks for sharing your experience and for the input! We have another blog coming up in the near future focusing on atmosphere and colors used within a space, so keep an eye out! I agree that it’s important to add natural light. I think it’s even a good idea to bring more nature into the workplace. A couple simple plants can make an office feel more alive and less stagnant. Thanks for sharing this! I agree that office design is one of the factors that make employees more productive and creativity. I would like to work in the office that has a great interior design. Never forget to take care of your office desk. Make it more comfortable. The more comfortable you are with your desk, the more productive you can be. This is a wonderful read. I agree that there are many more elements that go into the design of an office or work space that contribute to the well being and productivity of the employees, as well as the impressions clients may receive when they step foot into your business. The points covered in http://redesignproperties.com/blog/los-angeles-law-office-design-law-firm-interior-design/#comment-2617 completely coincide with yours. Thank you for educating us. I totally agree with you on the comfortable working space, I couldn’t imagine working in the office with so many clutter around. Great share! Thanks for sharing your designs with tips. I agree with you points. Office Designs place a vital role, Employees attracts to work and spend more time with the work in office with cheerful and enthusiastic. Once again thanks for the post.! Very informative article, i was just thinking what should i do to my office (visually) to make it look more “exciting” So thanks for the article! We would love to see what you have decided for. Good luck for whatever you choose! Great article thanks for sharing Design Tips for the Office with us… I agree with your points. Thanks for sharing this informative blogs with us..! office design is one of the factors that make employees more productive and creative. I am really impressed with your office furniture design concept. The proper decoration is the main issue to increase productivity. Thanks for sharing this article. I think that one of the biggest things you have to include is ergonomics and efficiency. One often feeds into the other when it comes to office comforts, i have found. Thanks for these tips. I really liked the tip about positioning desks in front of windows. This is some really good information about designing an office building. I liked that you pointed out that you should make sure that there is a good amount of natural light in the building. That does seem like a good way to keep your employees happy. Great office design concept. Thanks for sharing this post. Would help a lot. Thank you !! Your blog has fun curated ideas to improve workspace, build it to next level. This blog is perfect for this time for me. Your blog has inspired us to plan and design effectively. You can ever refer to our site for details in integrated appliances Dunmow . Thank you for this blog was great to read. I really like the 4th point: The perfect Shade. The color combination of Red, Orange and Yellow, Green and Blue are perfect. Thanks for sharing this informative post. The tips you have mentioned in this post are awesome. This post is really helpful to the readers I really like the tip the perfect shade I think is an important factor to consider……..Keep posting! Office furniture is an investment, and you want to choose wisely so you don’t have to replace them a few months or years down the line. This is some really good information about office design. It is good to know that it would be smart to make sure that you get comfortable furniture. Personally, I wouldn’t want to worry about not having comfortable chairs to sit in. I think while designing the office interiors, comfort and ergonomics matter most. Natural lighting can be helpful unless it heats up the room. The furniture should be arranged such that there is enough space to move around as well. This blog you have shared is helpful while planning how to do office interiors. Thanks for the share! I can confirm that colors can influence the psychological state when it comes to office design. If is often found that functionality and comfort of office furniture can help me perform to the best of my abilities.